School of Thought | Rants, raves & my two cents on the world of advertising. Last week I visited Dallas for some in-homes with consumers. While there, I checked out a local sandwich shop with the craziest Coke machine I’ve ever seen. 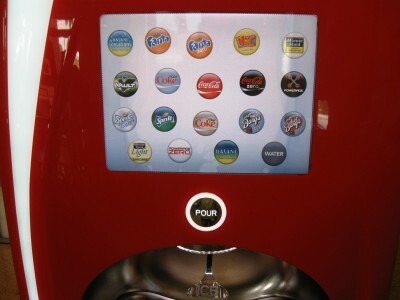 With 106 choices, my dream beverage was just a couple taps away on the touch screen. What I didn’t expect, however, was the near paralysis I faced when I had to make a choice. Usually, it’s a no-brainer – ‘I’ll take a Diet Coke, or Coke Zero if you have it.’ But now, there were flavors I never even knew existed – and I wanted to try all of them. I felt like a little kid – giggling at all the fizzy goodness that awaited my ultimate decision and then landing on Strawberry Fanta Zero. A good choice overall, but after half of my drink, I ended up wanting the old classic. For some reason, couldn’t get myself to choose boring, old Diet Coke with the plethora of exotic soft drinks at my disposal. Perhaps Barry Schwartz can explain it better. This makes me think differently about infographics. Too often, they’re relegated to the business world, but what about their role in everyday life? To me, it seems that they could play a large part in reducing waste in people’s lives – whether it’s the bathwater above, or the dishwater. I love this idea found on PSFK. I was cleaning out my Google Reader tonight when I ran into this gem by Seth Godin. It’s a compelling idea that’s takes brand differentiation to another level. Kevin Maney has a book out in September about the trade off between delivering extraordinary experiences (which he calls fidelity) and doing it in a way that’s cheap and easy (convenience). The book takes this simple idea and supports it with dozens of examples. The simplest example is movies. You pay to go to a theatre when you want the fidelity of the big screen and the crowd and the speakers. You stay home when you want the convenience of Netflix and the pause button. Vinyl records and live concerts offer fidelity, MP3 on your iPod is convenient. The mistake that’s so easy to make is to be a little bit higher fidelity and a little bit more convenient. Incumbents fall into this trap all the time, assuming that you’ll stick with what you’ve got because they’re sorta both. And insurgents almost always fail because as geeky insiders they think that twice the convenience is enough to persuade anyone who cares. Not going to work. Is That a Chicken on the Corner? It’s always sort of like finding a secret treasure when you run into something unexpected on Google’s Street View. Last year, Google caught Cubs Manager Lou Pinella walking down Clark Street, just outside the Friendly Confines. But this one is no coincidence. Pittsburgh artists Robin Hewlett and Ben Kinsley organized a neighborhood-wide production when the Google Maps crew came to town. They wanted to give the neighborhood a choice as to how it was portrayed to the world. And through realistic (but planned) events, they did. As the Google crew’s car turned onto Sampsonia Street, the marching band greeted them as onlookers watched the parade unfold before their eyes. Next up, the crew drove through a 5-person marathon, that of course, just *happened* to be occurring the same day and time as the parade. Just a couple houses down, a garage band held practice next door to a mad scientist experiment. And, like every neighborhood I know, there were two firemen saving a cat from a tree to round out the day. Take a look at Street With a View to find out more – and of course, to check them out on Google Maps. Another homerun by Honda. This time, to promote their affordable hybrid, they used headlights as a makeshift LED screen. Not only is it beautiful work, I’m thoroughly impressed that an idea of this magnitude and complication actually got through the agency/client process. Maybe I’m a little jaded, but (much!) simpler ideas than this have been killed because it would simply be a bit of a challenge. So, bravo Honda! And bravo, Wieden! Check out the behind-the-scenes look at how they made the spot. For all those who may have missed the announcement, Rob Campell is heading up the next Account Planning School of the Web. It’s due April 15th, coinciding nicely with Tax Day in the U.S., so I would recommend not leaving both for the last day. Good luck to all! Leon over at The Planning Lab has gone and done something downright brilliant for all of us young, aspiring planners. He asked two handfuls of planning’s greatest to share their advice for the next generation of planners (i.e. you & I). While there’s a ton of great stuff out there on the interwebs, right now this is topping the charts for me. I’m simply in awe of this music video for Her Morning Elegance by Oren Lavie. It’s beautiful. It’s whimsical. And it’s exactly what I imagine dreams to be. And welcome to the School of Thought. Make yourself at home - look around, leave a comment or two and drop me a line. Email me!